One of the core reasons you purchased Pardot and Salesforce is to be able to have full visibility on the ROI of your different channels. To be able to show that X was spent on a particular channel and it generated Y is extremely useful when presenting to the C-suite and linking marketing activity with sales performance. Yet with so many channels, and prospects engaging with multiple different campaigns before converting, you would be right in thinking that revenue should be shared across multiple campaigns. A last touch attribution model is not insightful enough. This is where marketing attribution using Salesforce and Pardot together is essential. Before going into a little more detail into what that is and how you can use Pardot to set campaign attribution up, it’s important to understand the basics of how Pardot reporting works. To use Pardot effectively, you need to ensure that data enters your data ‘ecosystem’ via Pardot first. There’s a number of reasons for this, mostly due to the way the reporting works. For example, if you input data into Salesforce first and assign to a user, Pardot will immediately think that prospect is an MQL and update the Lifecycle & Campaign Report to show the MQL generated. Furthermore, the velocity chart will be skewed as the average time from visitor to prospect to MQL will be completely wrong. The below diagram I drew up shows the direction of travel for data and I talk about this in more detail on my other blog here. The gist is that data will enter Pardot first as this is your filter and the first line of defence for data hygiene. If all prospects are vetted by Pardot first via a well thought out lead qualification criteria and subsequent automated lead assignment, then, in theory, Salesforce will naturally become a clean database full of genuine MQL’s/Leads and Contacts. Once nurtured and qualified, the prospect will be assigned (MQL) and then synced to Salesforce. Sales will pick this up (depending on your process) and then an opportunity will be associated (SQL). This syncs back to Pardot and updates the values generated for that particular Pardot campaign and when the opportunity closes, ROI can be calculated. This is where things start to get a lot smarter. The above shows a basic ROI relationship where you’re looking at direct input (Pardot Campaign Cost) vs. output (Revenue) on a particular channel. An example being if you spend £10,000 on Google Ads, you check in on the report and can see a total Revenue figure from the Google Ads campaign as £20,000. Good job, the ROI is 100%. What about all of the other touchpoints? Marketing attribution modelling enables you to use Pardot to track ROI on the source where the prospect was acquired. However, we want to be able to see how effective that whitepaper was or whether the event you attended made any impact, or perhaps you held a webinar and need to see if that’s impacting conversions. A blended approach of Pardot campaigns with Salesforce campaigns enables this whole new world of detailed reporting. Use Pardot campaigns to track the ROI on the source and Salesforce campaigns to track the impact of each touchpoint. What you may end up with is something similar to the below campaign attribution report, which shows the first touch, last touch and even touch. Sales can no longer suggest that marketing does all of the fluffy business activities as we can prove our efforts are contributing towards conversions. This is one of the most highly requested features and there’s a good reason for it. 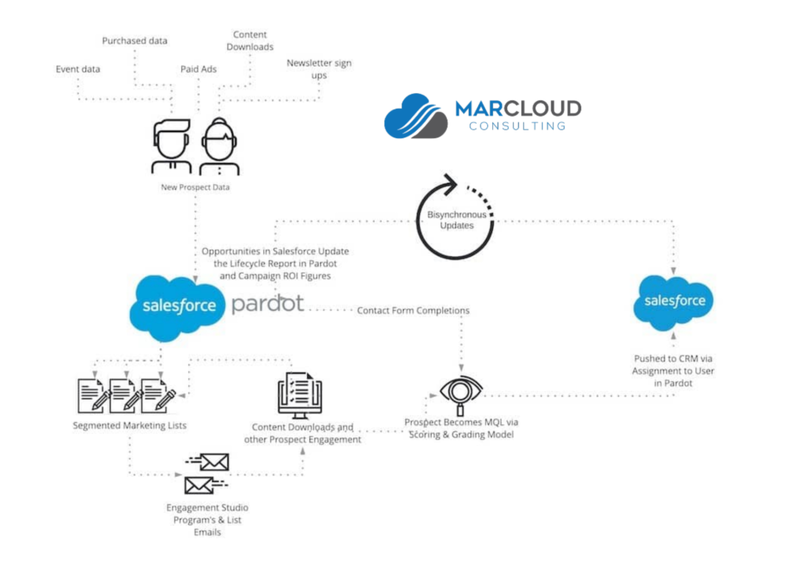 Connect Campaigns connects Pardot campaigns and Salesforce campaigns so that the campaign creation process begins in Salesforce. All campaigns begin in Salesforce and sync across to Pardot which means activities are completely aligned and reporting is more standardised. 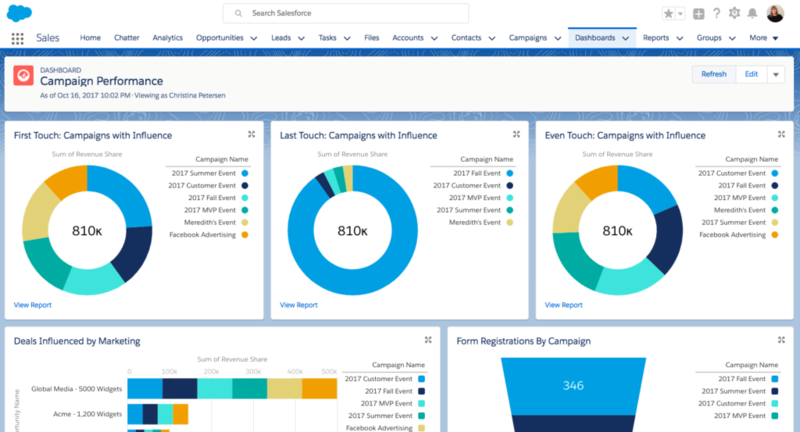 When campaigns are connected, campaign influence is enabled and so is the option to view engagement history on the same record within Salesforce. Customisable campaign influence lets you set up a logic that tracks the amount of influence a marketing campaign has on opportunities. Each campaign will be different, so you’ll have full control over the amount of influence each campaign has, whether it be an automated process you opt for or a manual one. There are a few options to choose from when setting this up. You could opt to evenly distribute credit across all campaigns that are associated with an opportunity. In this example, if a prospect converted via a Google Ads campaign, downloaded a whitepaper, attended a webinar and then engaged on social, then each campaign would receive 25% of the credit. Alternatively, you might want to customise this by attributing more weight towards the last touch campaign and decide how to retrospectively calculate the rest of the distribution. More information on these types of models can be found here.  If you have any questions about proving marketing attribution or Pardot reporting, connect with me on LinkedIn or drop me a message about Pardot here.